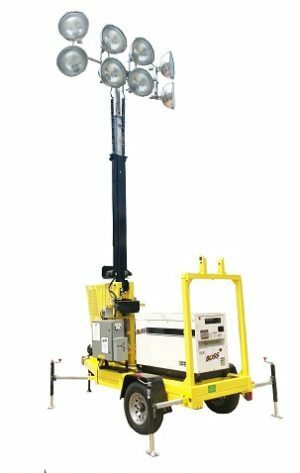 PORTABLE GENERAL PURPOSE 30-40 FOOT LIGHT TOWERS are the industries most commonly used light towers. All national equipment rental companies use exclusively 30′ light towers in their rental fleets. Bossltg is the only USA company that offers 40′ light towers. Both 30′ light towers come with 4 x 1000w metal halide floodlights powered by a 6kw diesel generator set with a 30 gallon fuel tank that will operate for 60 continuous hours. Light Towers are mounted on a two wheel towable trailer. 40′ light towers will project light over a 25% larger area than commercial 30′ light towers. 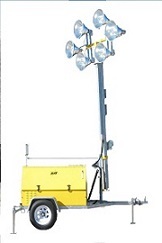 The 40′ light towers are designed to be used with 1500w metal halide floodlights. When doing so not only will light be project over a 25% larger area the increase in wattage of the floodlights to 1500 watts with produce 50% more light output than the 30′ commercial towers. In most applications one 40′ tower with 4 x 1500w floodlights will take the place of 2-1/2 commercial 30′ towers. Boss is able to achieve this higher light output because of the special type of floodlights that are used. At 40′ 4x1500w floodlights will project light 450′ where as a 30′ tower with 4x1000w floodlights will only project like 200′.